Nicolas Guillen is one of the greatest Cuban poets and one of the most outstanding Spanish-speaking poets. His main work was Songoro Cosongo. An Afro-Cuban, he united a masterly utilisation of poetic techniques in the Spanish tradition with expressions, themes, and feelings of the Afro-Caribbean culture of the Black slaves and their descendants. The poem below was first published in the compilation Poetic Offering of Cuba to the Soviet Union, Havana, National Anti-Fascist Front, 1942. It was also published in an anthology together with Spain, poem in four anguishes and one hope – dedicated to the Spanish Civil War and Other Poems. The translation below follows the text of the edition of the Publishing House of Cuban Literature in Havana, 1985, pp. 226-227. 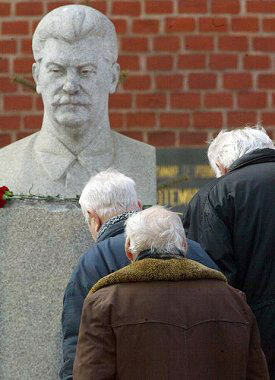 Homage to Stalin at the Kremlin Wall on 5th March 2003, on his 50th Death Anniversary. The White, with green eyes and beard of saffron. Europe’s map of stone and coal trembles. A thousand centuries collapse and roll about emptily. The North and South winds blast like cannons. Heads and decapitated heads encircle. The sea burning like a lake of tar. yet also greases its engines and rails. Protected by Chango and sheltered by Ochun. The peoples awaken, and march at your side! (1) Chango and Ochun are two gods in some African polytheistic religions, whose memory is preserved in the African-American culture of the Caribbean (Cuban Santeria and other similar syncretic religions). They represent Thunder/War and Water/Love. (2) This passage alludes particularly to the culture of the Far East, incorporated in the world struggle against the Hitler coalition, which included Imperial Japan. It is above all a reference to the culture of China. (3) Pichincha is one of the volcanic mountains in the Andean range, and gives its name to the Ecuadorian province which includes Quito, the capital of the Republic. The passage alludes to the great world alliance against Hitler, which included the peoples of the Americas. Translated from the Spanish by Alfonso Casal. This entry was posted in Uncategorized on August 21, 2015 by Alfonso Casal. In stump speeches and lectures given by Republican candidates for several cycles now, we have heard them bat about the term “American Exceptionalism” multiple times. They tout it like a flag, boldly and proudly, proclaiming it as a status of greatness. When asked, they inevitably give credit for the term to Alexis de Tocqueville, a French aristocrat who wrote the book Democracy in America. The problem is that the phrase “American Exceptionalism” does not appear anywhere within that book. In fact, the term does not exist anywhere, until 1929. In 1929, the phrase first appeared, in a letter to the head of an American political party from the head of a foreign state. Which party and what state? Democratic from France? No. Republican from Britain? No. The letter was to one of the leaders of the Communist Party USA, Jay Lovestone. And, it was from the Soviet Union’s General Secretary, Joseph Stalin. Jay Lovestone sent Stalin an explanation as to why workers in the United States were not inclined to engage in widespread civil disobedience, and that the general rules of industrialization did not appear to cause them as much discomfort as it did their counterparts in Europe. He said in effect that America was an exception to the economic rules that the Bolshevik’s had built their own models upon. In effect, America’s still expanding frontier, and that it was still growing, meant that the usual rhetoric and explanations did not resonate with the people of the United States. In response, Joseph Stalin replied back that there was an “American Exceptionalism” in place. Not that America was “exceptional,” but that America viewed itself as the Exception to the established order. The Communists used the phrase in rhetoric and speeches, about how America felt it was the exception to the rules. Joseph Stalin believed that eventually it too would discover that the same rules over the economy still applied – a prophecy which came true only weeks later when the crash led to the Great Depression. And in a dire warning, the Soviet leader strongly felt that in an attempt to cling to this belief in an exception, the United States would eventually turn imperialistic, and become a military menace to the world in order to prove its exceptionalism. But, aside from the use by the Communists, the phrase had been forgotten, a minor note in campaign rhetoric, and there would have stayed Joseph Stalin’s little contribution to American identity if not for the New York Times. In 1980 the times ran a piece using the term pleading with both President Carter and then GOP nominee Ronald Reagan to defend that exception, saying it made the United States unique. And so began its entry into mainstream politics. Even then however, it was rarely used, until 2011 when suddenly it began appearing in every political campaign speech almost overnight. While it was used only a few hundred times from 1980-2000, after 2010, it appeared on average five times per day within major publications or speeches, and the rate continues to accelerate. It is rare to go through any political rally, stump speech, or news show talking head without stumbling over the phrase “American Exceptionalism.” And the majority of these it turns out are Republican candidates or pundits. So, this little letter from Joseph Stalin, criticizing America’s arrogance to believe that we were above any rules, is now being batted about as a positive thing. The irony would likely not be lost on the man. If anything else, it underscores that America is not exceptional, but that we are deathly afraid. As we have lost our status in the world through misguided wars against unarmed nations and revealed ourselves not as the world’s police force, but the world’s bully, American Exceptionalism means nothing less than an admission of our fear to the end of Pax America. Indeed, yes, the father of American Exceptionalism, Joseph Stalin has gotten the last laugh after all these years. Stalin with American Envoy, Harry Hopkins. This entry was posted in Uncategorized on August 19, 2015 by Alfonso Casal. This entry was posted in Uncategorized on August 16, 2015 by Alfonso Casal. “He gives the impression of a strong mind which is composed and wise. His brown eye is exceedingly kindly-and gentle. A child would like to sit in his lap and a dog would sidle -up to him. It is difficult to associate his personality and this impression of kindness and gentle simplicity with what has occurred here in connection with these purges and shootings of the Red Army generals, and so forth. His friends say, and Ambassador Troyanovsky assures me, that it had to be done to protect themselves against Germany-and that someday the outside world will know their side. This entry was posted in Uncategorized on August 15, 2015 by Alfonso Casal. Playing into the hands of Ukrainian nationalists, a monument to the so-called Ukrainian “Holodomor,” one the 20th century’s most famous myths and vitriolic pieces of anti-Soviet Propaganda, has been erected in the US capital. including ruthless terror against peaceful Jewish, Ukrainian and Russian civilians. In 1949 the CIA and the US State Department sponsored the OUN-UPA leaders’ immigration to the United States, planning to use them as subversion groups and intelligence agents in the Cold War against the Soviet Russia. One of them, Mykola Lebed was characterized as “a well-known sadist and collaborator of the Germans” by the CIA, according to Swedish-American historian Dr. Per Anders Rudling in his book “The OUN, the UPA and the Holocaust: A Study in the Manufacturing of Historical Myths.” However, this fact did not prevented the CIA from recruiting the former Nazi collaborator. “Mykola Lebed [who was responsible for the murder of Poles in Volhynia and Eastern Galicia] lived in Queens, New York, until the 1990s, totally supported by the CIA or State Department,” the US expert in Soviet history Professor Grover Carr Furr of Montclair State University, narrated in an interview with Sputnik in May, 2015. 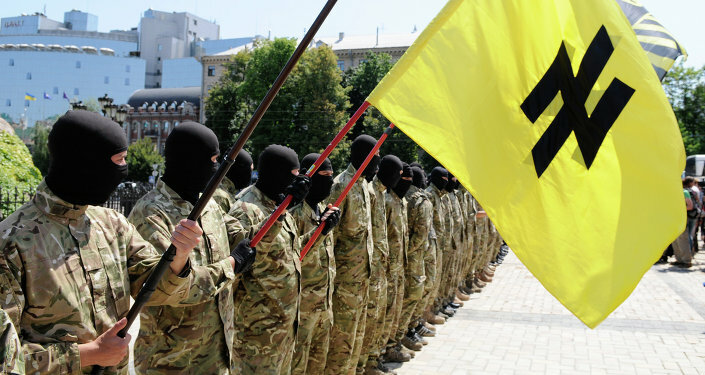 The CIA believed that Ukrainian nationalism could be used as an efficient cold war weapon. While the Ukrainian nationalists provided Washington with valuable information about its Cold War rivals, the CIA in return was placing the nationalist veterans into positions of influence and authority, helping them to create semi-academic institutions or academic positions in existing universities. By using these formal and informal academic networks, the Ukrainian nationalists had been disseminating anti-Russian propaganda, creating myths and re-writing history at the same time whitewashing the wartime crimes of OUN-UPA. One of these myths was “Holodomor” that claimed that the USSR and its leader Joseph Stalin deliberately starved to death from three to seven million Ukrainians. “In 1987 the film “Harvest of Despair” was made. It was the beginning of the ‘Holodomor’ movement. The film was entirely funded by Ukrainian nationalists, mainly in Canada. A Canadian scholar, Douglas Tottle, exposed the fact that the film took photographs from the 1921-22 ‘Volga famine’ and used them to illustrate the 1932-33 famine. Tottle later wrote a book, ‘Fraud, Famine, and Fascism: The Ukrainian Genocide Myth from Hitler to Harvard,’ about the phony ‘Holodomor’ issue,” Professor Furr elaborated. underscored.However, it was under Ukrainian President Viktor Yushchenko (who gained his power after the Western-sponsored Maidan uprising of 2004, also known as the Orange Revolution) when the anti-Russian myth making caught its second wind in Ukraine. Under Yushchenko, several institutes of “memory management” and “myth making” were established in the country.Both Russian and Western historians have questioned the “Holodomor” concept as well as evidently exaggerated number of victims of the famine of 1932-33 in Ukraine.American historian Professor Mark B. Tauger, West Virginia University, carried out thorough research on the famine of 1932-33 in the USSR, and came to the conclusion that the disaster was due to environmental circumstances and was evidently not related to the Soviet policy in the region. Tauger stressed that climatic conditions played the main role in the famine of 1932-33.
ignore the fact that there were serious famines in 1920-21, 1924, 1927 and 1928. “These studies minimize or ignore the actual harvest data, the environmental factors that caused low harvests, the repeated recovery from the famine and crop failures, the large harvests of the 1930s, the mechanization of Soviet farms in these years, Soviet population growth, and the long-term increases in food production and consumption over the Soviet period” (“Soviet Peasants and Collectivization, 1930-1939). and 1980s” (“Stalin, Soviet Agriculture and Collectivization, 1930-1939”). Remarkably, the famine of 1932-33 was the last famine that struck the Soviet Union with the exception for the famine of 1946-47 the country suffered from after the Second World War. Although the “Holodomor” myth was never based upon credible evidence and there are enough authentic sources to prove that it is a hoax, it is simply taken for granted. Unsurprisingly, Washington supports the myth as a part of its recent Cold War-style anti-Russian campaign. Alas, even repeated a thousand times a lie will never become the truth. This entry was posted in Uncategorized on August 9, 2015 by Alfonso Casal. Robert Conquest, after Leon Trotsky arguably the chief anticommunist and anti-Stalin propagandist of the 20th century, has died. Naturally, the capitalist media are fawning over him. A lot could be said about Conquest. I’ll say a bit at the end. Robert Conquest has also been identified as having worked for the IRD from when it was set up until 1956. The Information Research Department (IRD), was a section set up in 1947 (originally called the Communist Information Bureau) whose main task was to combat Communist influence throughout the world by planting stories among politicians, journalists and others in a position to influence public opinion. A 1978 story in the The Guardian alleged that Conquest’s work there was to contribute to the so-called “black history” of the Soviet Union — in other words, fake stories put out as fact and distributed among journalists and others able to influence public opinion. After he had formally left the IRD, Conquest continued to write books suggested by the IRD, with Secret Service support. His book The Great Terror, a basic anti-communist text on the subject of the power struggle that took place in the Soviet Union in 1937, was in fact a recompilation of text he had written when working for the secret services. The book was finished and published with the help of the IRD. A third of the publication run was bought by the Praeger Press, normally associated with the publication of literature originating from CIA sources. Conquest’s book was intended for presentation to “useful fools”, such as university professors and people working in the press, radio and TV. Conquest to this day remains, for anti-communist historians, one of the most important sources of material on the Soviet Union. generation of Cold War attitudes have contributed to what would be considered sloppy scholarship in any other area of inquiry. Getty also pointed out that Conquest specialized in anticommunist propaganda masquerading as scholarship while working for British intelligence. can hardly be considered valid scholarly works by his peers in the Western academic community. – Getty, “The Great Purges Reconsidered,” Ph.D. disseration, Boston College, 1979, p. 48. In 1980 I interviewed Professor John Hazard of Columbia University, at the time the world expert on Soviet law. Hazard told me that people in the Soviet studies field had told him that British intelligence was still doing Conquest’s research for him. evidence in any other field of history. – Getty, “The Great Purges Reconsidered,” Ph.D. disseration, Boston College, 1979, p. 64 note 57. “On Desk-Bout Parochialism, Commonsense Perspective, and Lousy Evidence: A Reply to Robert Conquest,” in Slavic Review 1986, 238-244. I don’t any other scholar officially in the field of Soviet history ever dared to attack Conquest head-on in print, in a mainstream journal. Conquest replied in kind, trashing Thurston’s book on the history of the USSR in the 1930s when it was published by Yale University Press in 1996. Thurston’s book was by far the best book on this period up to that point and is still the best because he rejects the knee-jerk anticommunist, anti-Stalin line and sticks to the evidence, with only a handful of lapses. “Fear and Belief in the USSR’s ‘Great Terror’: Response to Arrest, 1935-1939.” Slavic Review 45 (1986), 214-234. (This article elicited a hostile but very weak response by Conquest, to which Thurston replied with the article about “loosy evidence,” quoted above. Of course there was no deliberate famine. Quite the opposite: Collectivization put an end to famines in Russian – Ukraine. Conquest later retracted his view that Stalin had deliberately caused the famine. I have the quotation from him in my book _Blood Lies_. After my book _Khrushchev Lied_ was published in Russia I was interviewed by _Literaturnaia Rossia_, a literary-cultural journal. The interviewer asked me some tough questions, which was fine! I remembered this remark. It was probably the reason that in the early 1970s I read the first edition of Robert Conquest’s book The Great Terror when it was published. I was shaken by what I read! I should add that I could read the Russian language since I had already been studying Russian literature since High School. So I studied Conquest’s book very carefully. Apparently no one else had ever done this! Lots of footnotes, which are intended to fool the educated but naive reader. But those same footnotes made it possibel for me to discover that Conquest used phony evidence and _never_ proved “any_ of his anticommunist, anti-Stalin claims. He wasn’t “right.” Gorbachev was simply telling the same kinds of lies, and often the very same lies, about the Stalin period that Khrushchev and his people had told. Conquest got a lot of honors from the mass-murdering imperialists, from Margaret Thatcher to Ronald Reagan and beyond. He earned their praise. He also got a cushy, high-paying post at the Hoover Institution. Such are the rewards for telling lies on behalf of the anticommunists. We should realize that no one so honored by the chief mass murderers of world history can ever be telling the truth. Those of us who want to struggle for the better, communist world need to learn from the successes, as well as from the mistakes, of the Stalin-era Soviet Union and the worldwide communist movement of the 20th century, so we can imitate what they did right while avoiding what they did wrong. So, let’s redouble our commitment to doing just that. This entry was posted in Uncategorized on August 5, 2015 by Alfonso Casal. Thanks to the Stalin Society (Pakistan). Source: Jonathan Raban. (18 October 1992). “Books: Mr Miseryguts: Philip Larkin’s letters show all the grim …”, The Independent.